Holiday.gr - Neochori, a trip to a myth! Neohori is a small village lying over the Plastira lake. 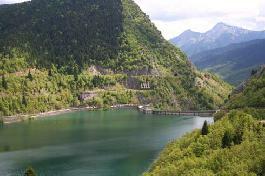 This village has probably the best view to the lake and all the tourist infrastructures for a pleasant stay. According to the 1525 Tamasiou Convention, Neohori was the capital of Agrafa. It was also the Bishopric seat of Fanari and Neohori from the 14th century to the 1821 Revolution. It is worth visiting the church of Saint Nikolas, with the impressive frescoes of the 16th and the 17th century. Everywhere in Neohori you will find hotels, guesthouses, rooms and apartments offering a cozy and hospitable stay. Been to Neochori ? Share your experiences!